The Nexus Risk TSA Group WA Open leaderboard is awash with West Australians as the Royal Perth layout rewarded experience. Playing in the morning field, Stephen Leaney set a blistering pace with a near perfect round, reeling off nine birdies and just the one bogey on the way to firing 8-under 64. “I played well, which was surprising, because when I warmed up I literally did not hit one shot in the middle of the clubface,” said Leaney. “So I wasn’t really sure what was going to happen. But it suddenly it clicked. I made a good swing down nine, the first hole and just sort of kept it going. “I just played smart. Having played here so many times, it doesn’t always help but I know that you don’t have to go crazy off the tee around here. You’ve just got to keep it on the fairway. Having played countless rounds at his home course of Royal Perth, Leaney’s tournament mindset paid dividends as he recorded his best round in a WA Open since before 2011. “I come back to such familiar golf courses that I forget I’m actually playing a tournament. I think in the past I’ve been a little bit too casual in my preparation,” added Leaney. “I just changed the way that I always played this golf course. I have always blazed away when I’ve been playing socially and I’ve never really thought about it. While there is a lot of golf still to be played, Leaney is hoping to record a victory for his children who aged 10 and 14 are too young to remember his last win at the 2004 WA Open. Playing alongside Leaney was fellow Royal Perth member Brett Rumford who relied on his course knowledge to combat some poor ball striking off the tee. Believing he left some shots on the course, Rumford still managed to fire 5-under 67 to be outright second after the morning field. “I didn’t drive it well and this golf course is all about driving. 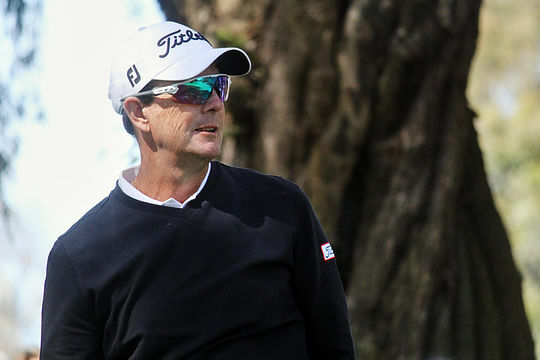 Steve just placed his ball all day and obviously just picked the place apart, did what you should do when you do drive it straight around here,” said ISPS HANDA World Super 6 Perth champion Brett Rumford. “I left a lot of shots out there because I just didn’t give myself the opportunities with wedges in my hand. Playing in the afternoon field West Australian Daniel Hoeve, 25, was stoked to see his name join Rumford on the leaderboard at 5-under the card. “It was out of the blue, I haven’t really done very well in these Tour events but I have been working hard and it is slowly coming together,” said Hoeve. Rounding out the top-5, on 4-under 68, after the first round are Michael Choi (VIC), Matthew Stieger (NSW), Tim Hart (QLD), Michael Sim (WA) and Damien Jordan (QLD). Defending champion Curtis Luck fired an even par round while LPGA graduate Hannah Green had 2-over 74. The Nexus Risk TSA Group WA Open Championship tees off on Thursday 19 October with the winner decided on Sunday 22 October. In addition to the winner’s share of the $100,000 prize purse, the champion will receive Official World Golf Ranking Points and be fully exempt onto the ISPS HANDA PGA Tour of Australasia until the end of the 2018 season. Third time lucky for Hannah Green at the WA Open?